Hyundai’s zero-emission fuel cell engine, which is used in the ix35, has been recognized as the first engine of its kind in the annual Ward’s 10 Best Engines by WardsAuto World. The WardsAuto World editors tested and named the most sophisticated engines available on the market today. 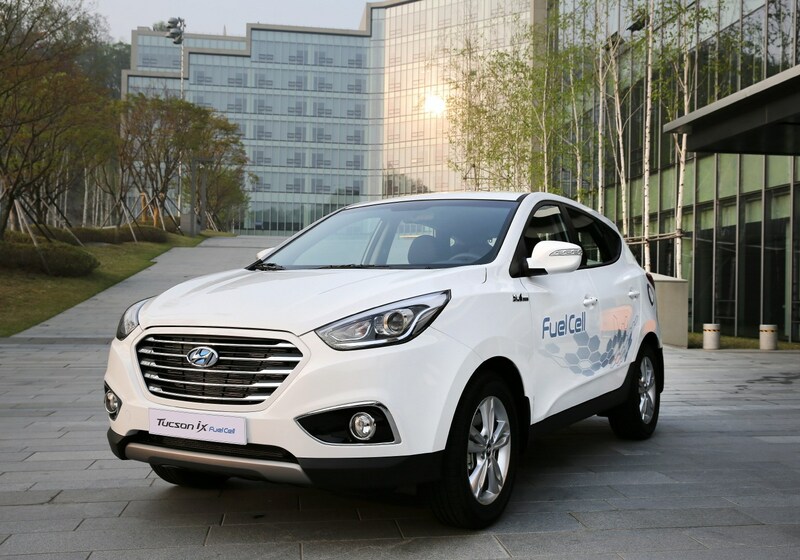 Hyundai Motor Company’s ix35 Fuel Cell, the world’s first mass-produced fuel cell electric vehicle, has been available in Southern California in the US since June 2014, when the first retail customer delivery took place. Outside the US, the fuel cell program is currently operating in about a dozen European countries. The ix35 Fuel Cell is now also available to customers in Canada. The inclusion of the fuel cell engine on Ward’s list follows Hyundai’s ix35 Fuel Cell selection as a finalist for Green Car Journal’s 2015 Green SUV of the Year™. The Green SUV of the Year™ winner will be announced at a press conference during the Washington Auto Show in Washington D.C. on 22 January. As a Green SUV of the Year™ finalist, the Hyundai Tucson Fuel Cell is also distinguished with Green Car Journal’s 2015 Green Car Product of Excellence honor. Hyundai’s fuel cell effectively replaces the battery pack used in an electric vehicle by generating electricity from hydrogen through an electrochemical process that does not involve hydrogen combustion, with no moving parts within the fuel cell stack. The ix35 Fuel Cell maintains the day-to-day flexibility of the petrol-powered ix35 so that its driver is able to immediately enjoy the next generation of electric vehicles without range or recharge-time compromises to their lifestyle. Ward’s 10 Best Engines, announced every December, is the list that defines the industry’s outstanding powertrains. Since the list began in 1995, Hyundai Motor has been included four times: the Tau V8 was honored in 2009, 2010 and 2011, and the Gamma I-4 in 2012. The award ceremony will take place at a banquet during the North American International Auto Show on 14 January in Detroit.